Just as we can shape specific colors in our images to create a specific look, we can “shape” specific sounds in our audio to create a specific sound. Most of the time, we use this shaping capability to create ear-catching sound effects. However, I also use these techniques to warm up a voice or, more importantly, to improve the clarity of speech. This is especially important when creating projects for older audiences who’s hearing may not be as good as you would like. One of the sad facts of life is that as we get older, we lose the ability to hear high-frequency sounds, which means that it becomes harder to understand what people are saying. In this article, I’ll show you how to improve the sound of a voice using FCP X, Premiere Pro and Adobe Audition. Once you understand how this technique works in one application you can use it anywhere, because all that changes is the interface. NOTE: Since this article was released, I added two companion articles on boosting and smoothing audio levels. The first article covers Final Cut Pro X and the second article covers Adobe Premier Pro CC. Whether we are listening to music, speech or noise, all human hearing is based on frequencies – the variations in the pitch of a sound – and volume. Audio frequencies are logarithmic. What this means is that each time the frequencies double, the pitch goes up an octave (for you music majors out there). So, while human hearing spans ten octaves, human speech only covers about five octaves. As we age, our ability to hear high-frequency sounds decreases. This means that, while we can hear that someone is talking, when we can’t clearly hear high frequencies, it becomes difficult to understand the dialog. A good analogy is listening to two people talk on the other side of a wall. You can hear them talking, but you can’t understand what they are saying. That’s because the low-frequency sounds pass through the wall, but the high-frequency sounds do not. By boosting specific frequencies, we can make sure that our audience is better able to understand what’s being said. Which gets me to the purpose of this article. To “warm up” a voice, we boost a range of bass frequencies. To improve clarity, we boost a range of higher frequencies. And the tool we use to accomplish both these tasks is called an EQ filter (EQ is shorthand for “equalization”). Here I’ve added a female narrator to my mix. 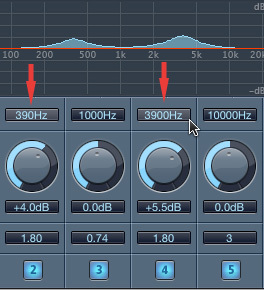 To apply an EQ filter, select the track, then choose Effects > Filter and EQ > Parametric Equalizer. H. A high-cut filter used for removing extreme high frequencies. What an EQ filter does is boost the gain (audio level) of a range of frequencies. When we adjust the volume of clip, we adjust all frequencies equally. An EQ filter allows us to boost some frequencies without boosting others. The key point you need to keep in mind is that, like gray-scale values, we can’t boost a single frequency. We are always adjusting a range. Sometimes a wide range, sometimes a narrow range, but ALWAYS a range. The numbers at the bottom of the filter window represent the adjustments we can make. Frequency. This sets the center of the range of frequencies we want adjusted. Gain. This determines the amount of change. Positive numbers boost the gain in that range of frequencies, while negative numbers reduce the gain in that range. Q/Width. This determines the width of the range of frequencies we want to adjust. Higher numbers create narrow ranges. When adjusting values for a voice, the default setting of 2 is a good choice. The easiest way to change a setting is grab the white dot in the frequency display and drag it. Men: Add 3-5 dB around 180 – 200 Hz. Women: Add 3-5 dB around 400 Hz. Don’t add too much. The more low-frequency emphasis you add tends to make the voice sound “rumbly” and muffled. In both these cases, we are making small adjustments. Think of this as adding seasoning to a soup. You aren’t going to change the flavor of the soup by adding salt, just as you won’t change the composition of a shot by removing a blue cast. However, you can make it better than it was. To compare your results, click the green Power button to enable (green) or disable (gray) the filter. Adjust the filter to best suit the voice and what you want it to sound like. FCP X has a very similar filter, and the settings are similar. In this case, select the clip, or clips, to which you want to apply the filter. 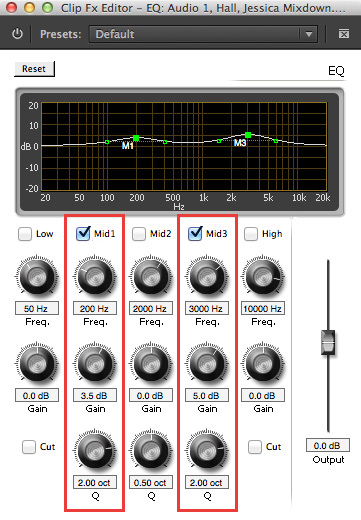 Scroll down in the Effects Browser (Cmd+5) to the Audio > EQ category. 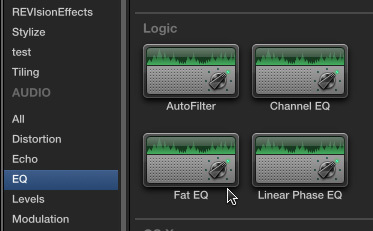 With the clip(s) still selected, go to the Inspector, click the Audio text tab, then click the small icon to the right of the Fat EQ effect name. 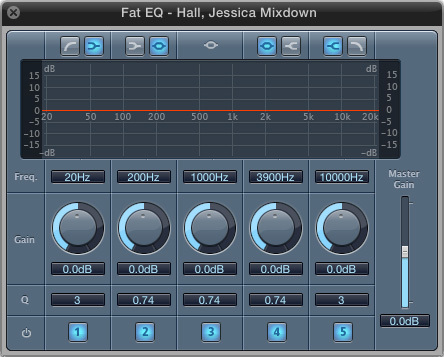 This displays the Fat EQ filter. Again, the 20 – 20K range of frequencies is displayed as a red line (bass is on the left). 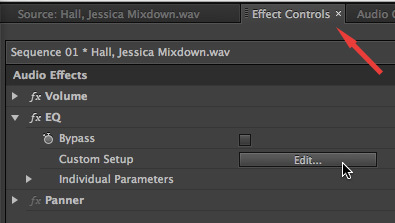 This has the same five settings as the Audition filter (without the low and high-cut settings). To boost the bass, click and drag the #2 round circular control up, or down, to change the amount of gain for the selected frequency range. Here are the settings I use for a man’s voice. Here are the settings I use for a woman’s voice. To disable a specific setting, click the blue number. Blue is active, gray is inactive. In Adobe Premiere Pro CC, select the clip, or clips, to which you want to apply the filter. Then, from the Effects panel drag the EQ filter on top of the selected clip(s). NOTE: There are two other EQ filters in Premiere that can be used: Parametric EQ and AUEQ. 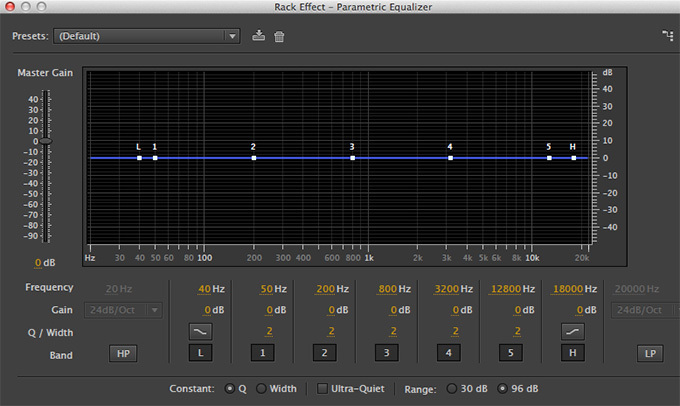 However, the interface on the Parametric EQ would scare anyone and the AUEQ filter is, as far as I know, Mac-only. I prefer to use the EQ filter. To display the filter, select the clip (if it isn’t already selected) and choose the Effect Controls panel. The filter is displayed in the list. Click the Edit button to display the interface. To disable to filter so you can compare what you are doing with the source clip, click the italic fX to the left the EQ filter name in the Effect Controls panel. There is no rule that says you have to use any of these settings. Often, I’ll boost the highs to improve clarity and leave the low frequencies alone. As with all things in audio, listen to the results and decide for yourself whether you like it or not. I also make a point to listen to final audio on speakers, not headsets. Often, headsets are too good and you hear things that can’t be heard when using speakers. Feel free to shift frequencies or adjust the gain to get the results you want. My numbers are starting points, not locked in stone. I manipulate the EQ in virtually everything I create. For my live podcasts and webinars, I take time to pick the best mic and preamp to get the sound I want because I can’t adjust the sound later. For post-production, I shape the sound using an EQ filter because I don’t always get the chance to specify what mic the talent will use. In all cases, though, consider the needs of your audience and what they need to hear. While I don’t do a lot of EQ adjustment for sound effects, and almost never for music, I always take the time to make sure my talent and narrators sound as good and clear and understanable as possible. Thank You For This Article. It’s helped me improve. Great article, Larry. But can you explain what exactly the Q setting does in the Fat EQ in FCP X? Using the slider control in the Inspector, I don’t seem to be able to get that setting to match exactly the one in the panel. For example, when I type in 2, it’s 180 in the panel. The Q setting determines how broadly the EQ adjustment is applied. A low Q spreads it across a wide range of frequencies, a high Q creates a “notch” or sharp peak where only a limited number of frequencies are affected. For warming a voice a Q of around 1 is fine. Great stuff as always Larry! I’ve learned a lot from you! Also, do you have any thoughts on lowering the mid section between the two Hz values you indicated at the low and high end? 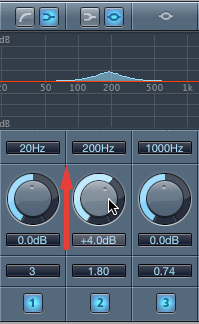 I’ve found that lowering the mids tends to smooth out vocals right around the 1200Hz mark. EQ is endlessly adjustable – especially for music. Every voice is different, as is every situation. If you like the sound, use it. There’s no wrong answer, just bad sound. thanks you – this was so clearly explained i was able to translate it to my cheap program Mixpad and get most of the ‘tin can’ effect off our leading lady. Hiss is a broad-spectrum problem – which makes it very hard to remove. However, try reducing frequencies around 6,000 Hz. If you have Adobe Audition, right clip the audio clip in Premiere and click “Edit clip in Adobe Audition”. 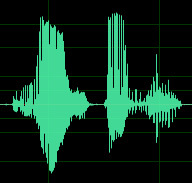 Highlight a portion of the clip with noise, feedback, static, hiss, vibration, etc. You can even go over some of the audio with the highlighted potion and Audition will still recognize the feedback. Click ” Effects > Noise Reduction > Capture Noise Print” This can also be done by pressing Shift + P. Then go to ” Edit > Select > Deselect All ” or press Command + Shift + A. Then go back to ” Effect > Noise Reduction > Noise Reduction (Process) ” or press Command + Shift + P. All background noise is eliminated. You can then press Command + S or ” File > Save “, go back to Premiere, click anywhere back into the window, and the edited audio clip will automatically save! I am editing an interview using a primary and secondary camera. The primary camera audio sounds great. Now after adding a section for the secondary camera before switching back to the primary camera, the audio sounds distorted, harsh, muffled, far away. Flat out awful. I had completely eliminated noise through Adobe Audition and have played around with declipping in Audition as wella s Parametric Equalizer in Premiere. Nothing seems to be working to soften and clear up his voice…. do you have any suggestions? He does not have a low man’s voice. It’s about average. * See if Izotope RX6, which is a powerful audio repair utility, can fix it. I’ve been working on a Home Theater setup and have scoured the internet for info. This is by far the most clearly stated method of improving vocal clarity I have come across. Thanks for sharing not only your knowledge but your ability to state things in a clear, concise manner. I refer to this page often and have found it very helpful. Is there a method you recommend to make a female voiceover sound slightly younger? Not really. Age is tone, breathing and forcefulness – and EQ can’t help there.